If ever I’m asked “where’s good in Covent Garden?”, my brain shuts down. Where normally neurons spark, buzz, flash and provide multiple ideas, there’s a deep, blank, empty nothing. Covent Garden? Good food? Uhhmmmm. Maybe this is a familiar feeling? If so, or if you’re a tourist or shopper drawn to the old piazza like a moth to light, but without a plan for lunch or dinner, then this guide is for you. To be honest, I’d thought for a while that this would be titled ‘not crap in Covent Garden’. But as I walked the streets reminding myself of meals eaten between Drury Lane to the east, St Martin’s Lane to the west, the Strand at the bottom and Shaftesbury Avenue and High Holborn up top, it became apparent that among the soulless chains and downright awful, there’s actually a great deal of good food to be had. It’s a lengthy read, but divided so that you can quickly find inspiration to suit your needs (are you looking for a top meal, or simply somewhere OK to stop because you’re in the area?). Many of the places mentioned will work for pre and post theatre. But that’s a whole other guide in itself. Do leave a comment below if you think I’ve missed something off (and it’s really, really good). This would be too long if I added addresses and opening times too, so you’ll need to click on the links for the finer details. Below are the places in Covent Garden that are really recommended for great food, proper service and good vibes. With the caveat that Covent Garden rent is high, and you should expect the bill to rack up (Native, 32GQS and perhaps The 10 Cases aside). Which doesn’t mean these restaurants are not good value, but they are a proper night out. Café Murano — Angela Hartnett’s restaurant (pictured at the top of the piece) is grown-up, yet relaxed, comfortable and perfectly pitched. The food derives from northern Italian cuisine, so expect superb cichetti to settle the hunger pangs (salt cod fritters and truffle arancini are particularly good), then quality antipasti, flawless fresh pasta for your primi (or main), then fish stews, Chicken Milanese, ox cheek with polenta and so on. Prices are very reasonable for the quality and location (mains all under £19). Bookable and private dining. Barrafina Drury Lane and Adelaide Street — Two of my favourite restaurants in the whole of London. Admittedly under the same banner, but they are so good and actually do feel different (so why not try both?). This is small plate eating of the highest quality, whether we’re talking simple peppers and anchovy on toast, unctuous ox tail on ethereal potato purée, or milk fed lamb’s kidneys. Everyone walks out of Barrafina buzzing and sated (and a little lighter of wallet). Though Adelaide Street tends to get the ‘best restaurant of the year’ plaudits, I’ve a soft spot for Drury Lane. Bookable and private dining. 32 Great Queen Street — To label 32GQS Mr Dependable is a little unfair. It’s more than that. But it also, well, is. Always great eating — British, seasonal, generous, flavour first food. And always a buzz. This is one of my go to central London group dinner or weekend lunch spots. Long may it continue. Bookable. The 10 Cases — An “unpretentious little Bistrot with wine as its main focus” undersells it a bit. The food here is great, whether you’re grabbing a small plate of cured meat or cheese to go with a good glass of wine, or a proper plate of crowd-pleasing bistro food. The menu changes with the seasons and the room and street front seating are chatty and lively. Super summer lunch spot. Like being in Paris, without the snarling. Bookable. 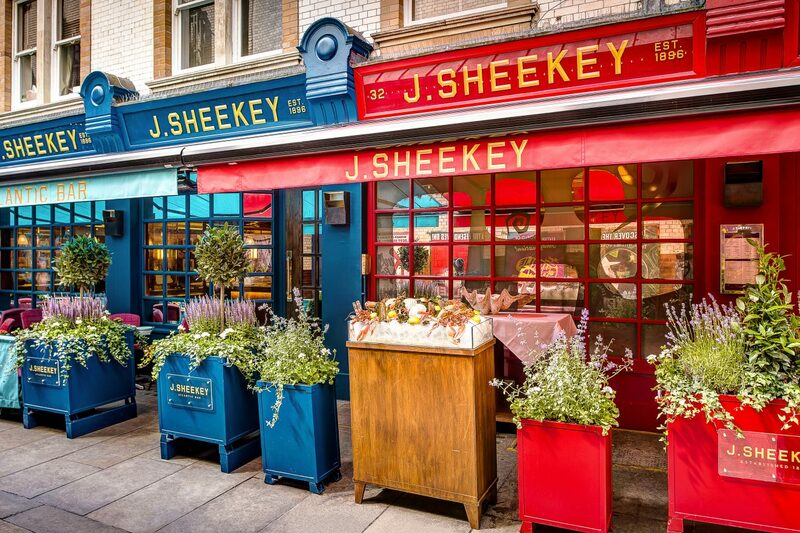 J Sheekey — You like seafood? You like a tablecloth? You like champagne? You want to spend a bit of cash … but get your money’s worth? Head to J Sheekey. It’s proper. Their Atlantic Bar is great too — for small plates and shellfish and more of that bubbly stuff. Terrace for the summer (and, apparently, the winter too). Bookable. Hawksmoor Seven Dials — This, I think, is my favourite of the Hawksmoor sites. It’s a sumptuous downstairs den of strong cocktails, great wines, and quality British grass fed beef (and a great deal more). They’re a significant group, now, but still a smart option if you want to sink your teeth into prime meat, stain your lips red, then walk out hours later, utterly confused that it’s still sunny, disorientated, and unsure how you’ll get home. Frenchie — New in 2016, Frenchie is an outpost of Gregory Marchand’s Parisian bistro with the same name. The food is inventive and enjoyable, and the rooms (both upstairs and downstairs), stylish, chic and generally quite lovely. When I visited at the beginning of the year, I felt the prices were quite high and the menu a little confused. The menu’s been straightened up now, and who knows portions and prices may match better? Regardless, it’s all very well done. Bookable. Native — Less polished and cash-backed than the others on this list, Native is here because it’s a rare star of an independent, owner-run, central London restaurant. This Neal’s Yard cubby hole/tardis has a cute chef’s counter on the ground floor, and room for about 26 or so downstairs. The food is ultra seasonal, often ‘wild’, always inventive and cooked with love and soul. 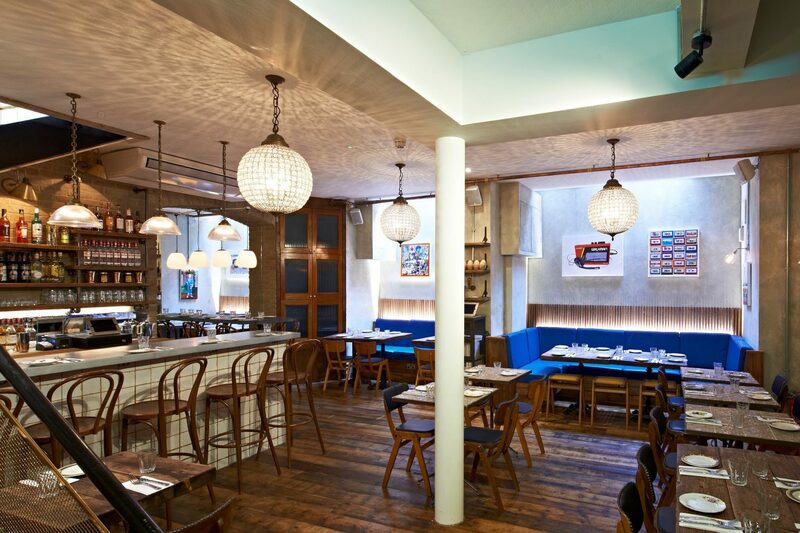 If, for you, it’s about the food, not padded seats and plush surrounds, give Native a go. Great value. Bookable, though some seats always set aside for walk-ins. The Barbary — Food from the Middle-East cooked in front of you. Frenetic and flavourful, this is contemporary counter eating for people with a global palate and a desire for full-on sensory stimulation. The menu is short, the food high impact, and whatever time you’re reading this, there’s probably already a queue. Spring — Not technically in Covent Garden, but if you crave some calm, then hop over the Strand and into Somerset House. Skye Gyngell’s restaurant is beautiful and serene, and the food matches it — simple cooking to make the most of quality ingredients. You pay for that, but it does restore, which is what restaurants are meant to do. Bookable. Opera Tavern — There are tens of tapas places in Covent Garden. Opera Tavern has top quality meats and cheeses, but also a host of inventive hot dishes around the £9 mark too. If you’re in a group of 3 or 4, it’s a great place to settle in to with a glass of sherry or warming red wine. Bookable. Perhaps you’re after a glass of bubbles and some oysters, or wish to experience one of London’s eating institutions. The following will sort you out. Rules — London’s oldest restaurant serves classic British food in atmospheric, red velvet banqueted, starched table cloth surrounds. There are various London club style things on the menu, but I’d suggest heading here during game season for pheasant, grouse, partridge et al, or a steak and kidney suet pie. Plus a bottle of claret. Bookable. 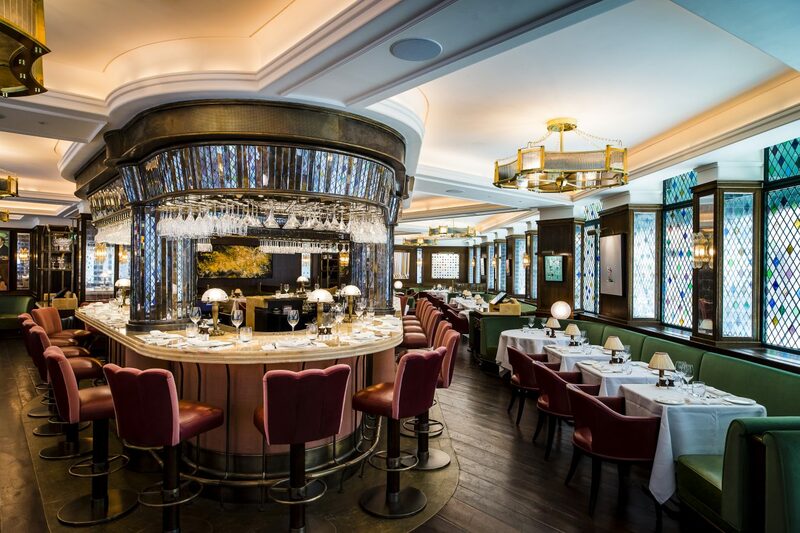 Balthazar — Want to impress, or feel a bit glam? Balthazar’s shiny champagne bar and a few bivalve molluscs ought to do the trick. A grand, super central setting for a brasserie or bistro meal. Bookable. Clos Maggiore — Forever oscillating with Soho’s Andrew Edmunds as ‘London’s most romantic restaurant’; almost certainly because every February lazy journalists Google and ctl-c the previous year’s list. I’ve never been, but I’m not immune to laziness. The menu looks good, though. Focused on quality ingredients. Possibly a bit stiff. Certainly pricey. Bookable. The Ivy — The Ivy can’t claim to be THE place to eat and be seen any more. But it does have a certain je ne sais quoi, and last year’s refit (pictured above) ensures it’s a great spot with decent food; the menu’s an idiosyncratic mix of home comfort (shepherd’s pie, sausages and mash) and Asian fusion, but the service is slick and stylish, and you’ll feel like you’ve been out for a meal. Bookable. The Delaunay — Often the restaurant I recommend to people who aren’t regular London eaters, and who want somewhere central to eat after a day ‘up town’, or prior to a theatre performance. Corbin and King’s Viennese grand café has just the right mix of glamour and homeliness. Plus loads of sausages, schnitzels and cakes. Serves food from 7:00am to midnight. Bookable. If you’ve been tasked with finding somewhere to eat in Covent Garden, there’s every chance you’re not aiming for the meal of the year; rather, you just want somewhere convenient for you and a friend or a large group to eat whilst you catch up. Nothing wrong with that. These chains will facilitate. 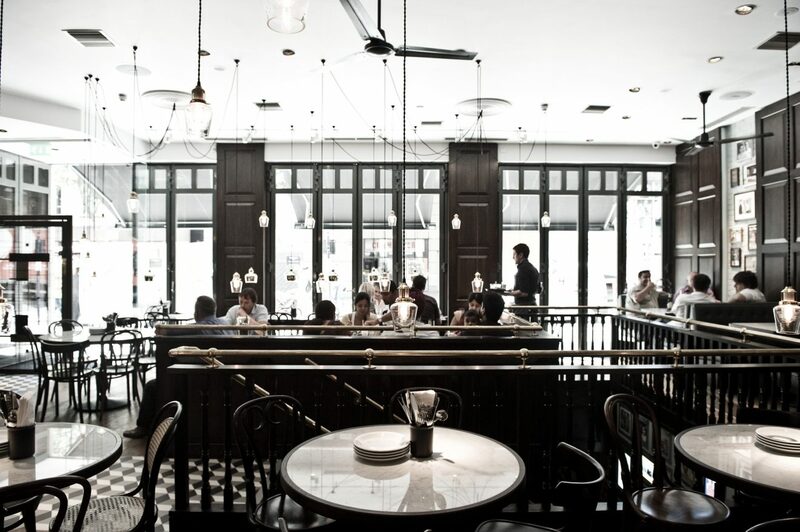 Dishoom — Good, contemporary, affordable Indian food in a considered setting. Its famous bacon and egg naan makes it one of London’s best breakfast options. Theoretically bookable, but mostly walk-ins. Sticks n Sushi — Enjoyable, mid-level sushi in a convivial setting. All bases covered with a few platter and menu options if choosing is daunting in a group. Yakitori too. Bookable. Polpo — the original Polpo in Soho started so many of London’s restaurant trends (exposed filaments, bare bricks, negronis, small plates, tattoos, no bookings). Now there are seven or eight of them, they’re not ‘cool’ any more. But the satisfying small plates of fresh, Venetian-inspired food remain — never costing more than £10, often £4 — and the service is still on point. So you absolutely can build a good meal and have a great time. No reservations. Wahaca — Really good option for big groups. This accessible chain of modern Mexican restaurants will sort a fun meal for all, whether you’re up for sharing tacos and street food, or want your own burrito or plate of grilled fish. Large groups can book. Otherwise wait in the bar. Kulu Kulu — conveyor belt sushi tucked on the north east edge of the area. Strong option away from the crowds. No reservations. As above, you’re not always after the meal of your life. Just somewhere the food is good enough and, in the case of these options, fast, relaxed, and keenly priced. Perhaps they’re new to you, or perhaps they’re favourites already, and you’ll find comfort in the knowledge they’ve a site in the area. Chick ‘n’ Sours — to my mind, London’s best fried chicken. Whether that’s wing, thigh and drumstick, burger or whole (on a Sunday). Zingy saucing and quality sourcing. There’s a satisfying, non-greasy crunch to the batter, top chicken within, and vigorous side dishes. Bookable, plus tables held for walk-ins. Flat Iron — Great concept: £10 steak. Obviously sides add a bit, but it’s still great value and pretty quick (if you want it to be). The Henrietta St branch is as good as any of this growing brand. No reservations. On the Bab — Contemporary Korean sorta street food. Good eats. Normally no reservations, though possible for 8+. Pizza Pilgrims — Great Neapolitan sourdough pizza. No reservations. Franco Manca — Also, great Neapolitan sourdough pizza. No reservations. Homeslice — Large pizzas to share. Non traditional toppings. No reservations. Honest Burgers — Good burgers. Possibly the best at keeping the standard across an ever expanding mini-chain. No reservations. Byron — Not what it was when it began the march of quality burgers in Britain, but their Wellington Street site is a great room for groups and weary wanderers, and their burgers perfectly acceptable. Bookable. Shakeshack — The American gourmet burger champs. In the piazza. No seats. No reservations. MeatMarket — For those who like their burgers, chillidogs and chicken wings messy (filthy?). Supreme onion rings. No reservations. Because you just want a sandwich. Or a coffee. Or a cake. Or all three. And you know that the High Street chains are rank. Fabrique — Cardamom buns, hygge, and good coffee. Notes — Quality coffee, cold meat and cheese platters. Good place to sit for a bit. Lundenwic — Excellent independent coffee shop just off Aldwych. Good toasties, house made salads, avo on toast, and baked goods. Bit of a gem, this one. Bread Ahead — Coffee, fresh bread, sandwiches, and, of course, doughnuts. Essential if your energy is waning. Monmouth Coffee — Light years ahead of the modern coffee scene, but still relevant now, Monmouth Coffee has been a fixture on Monmouth Street (“oh that’s where the name’s from …”) for over 3 decades. That’s a whole load of beans roasted, brewed, tamped and poured. Their Covent Garden site is a bit of a whirlwind; if you’re planning on staying, check if there’s a place to sit, as if there is you don’t need to stand in the takeaway queue. 26 Grains — Cute, wholesome, tasty and tasteful porridge, salad, soup and sandwich shop in Neal’s Yard. Cafe Murano Pastificio — We finish where we started: Cafe Murano’s Pastificio is where the restaurant’s pasta is made during the day, but also a deli with a tight but tasty menu of meats, cheeses, sandwiches, pastries and wine. Lovely place to stop. Also, killer take-home pasta, sauce and wine deal. Private dining possibilities too. * Photo credit for J Sheekey and The Ivy: Paul Winch Furness. Like this? Buy my book! Ah, Sesame, RIP. Such a shame it closed! Great list. J Sheekey is last-meal-on-earth levels of good. Only addition I would make is Koshari Street under fast casual. Very good for a fast, filling lunch, esp for vegetarians (not 100% certain it’s vegan, but could be). Hi Sarah. Yes, Sesame was good. Don’t know why it didn’t last. I do quite like Koshari, though don’t really know how to pigeonhole it. Lunch on the go? Lovely list. Please would you do an app? Pretty please? Hi Ed – I think Koshari Street probably slots in under cafes and coffee shops. The menu is structured differently, but that’s what it’s closest to in its function. Sign up for a weekly prompt about #Supplemental, and a monthly email on all things food..